FOR the last two men to lead Kildare to an All-Ireland final, their place in any GAA Hall of Fame was already well assured. Mick O’Dwyer, with the seniors in 1998, and Glenn Ryan, with the under 21s ten years later, were already household names due to their glittering playing and management careers. Davy Burke would be the first to admit that he does not yet possess the kind of GAA CV that those two men can boast but he is well on his way to making his own mark on the game. He is preparing to lead Kildare out in an Under 20 All-Ireland Final at just 30 years of age after he was left with no choice but to turn to coaching once his hopes of making it as a player were ended by a horrific knee injury when aged 14. “I badly hurt my knee, tore my cruciate and I also fractured my kneecap,” said the Confey club man. “Back then MRIs were limited enough so it was x-rays all the way. I had a cast from my hip to my ankle but about two months later I went back out to play, the break was fixed but the cruciate wasn’t unfortunately and the first time I went to turn I wrecked everything. The whole knee was gone, I actually have a plastic kneecap. That was the end of my career at 14 and a half,” said Burke, but he admits the injury may have proved to be a blessing in disguise. “Even though I had represented Kildare at underage I don’t think I was ever going to be a star,” he laughed. Though his playing days were ended before they ever really had a chance to get off the ground, that was never going to be end of his love affair with the GAA. 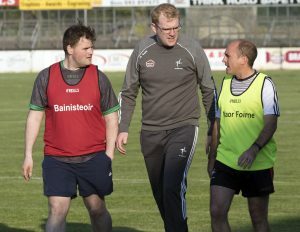 Born into a fanatical GAA household, it wasn’t long before he was drawn back to the Confey training field, this time in a coaching capacity. “My family were engrained in it. My parents were founder members of Confey GAA club, particularly the ladies side of it but the mens too. My dad was a teacher in St Davids, Artane in Dublin, a big football school in Dublin and he would have managed the likes of Stephen Cluxton, Stephen McPhail and different fellas like that through the years. It was just in me, I was born and bred with an O’Neills in my hand. My career was over at 14, 15 basically and that was my outlet with the lads and all my friends. My mam was going up to the pitch, my dad was going up to the pitch so it wasn’t long before I was back going up to the pitch,” said Burke. What Burke quickly found was that he had a knack for coaching and managing. “I got involved with the underage teams, the nursery in Confey. I think I was I the youngest ever recipient of the foundation level coaching course, I think I was 17 and then by the time I was 19 I had Award 1 and then 20 or so when I got the Award 2. I just got stuck into it because it was such a huge passion for me and my family and I didn’t want to miss out. “With the nursery we had a good run in the Feile one year. 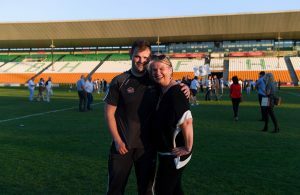 From there, Maria Fallon was in charge of the ladies side of things in Confey and she gave me my break with the senior team and I took over them in 2008. We won the Division 1 league for the first time ever in 2008, won the double in 2009 which was the first time the club won the senior championship, which is named after my da. That was my break to be honest, we had a good run in Leinster after winning Kildare in 2009. We beat Na Fianna, we beat Foxrock/Cabinteely. I was with the Kildare minor ladies for a couple of years and there were some great girls there it moved on and I ended up doing two years as selector with Greg McGonigle with Dublin,” said Burke. Alongside McGonigle, he got to experience two All-Ireland finals in Croke Park but both ended in defeat to a great Cork team. “We had two serious years there. We reached two All-Ireland finals but unfortunately were beaten both times by Cork. The first year we were ten points up with seven or eight minutes to go and were beaten. That Cork team were a phenomenal side but that was a heartbreaking loss, absolutely heartbreaking. “The following year we lost by a point to Cork as well. The one thing about that is, and I have already said this to the lads, that is huge experience for me to have. This is my third All-Ireland final in Croke Park. I’ve been there and been ten points up, I’ve been in a nip and tuck game and came out the wrong side of both but I can use all that experience. Even to have gone through the build up and how to get everybody focused is a big thing. When it comes to gameday I know all the ins and outs of the pre-match routines. I think that will be a big advantage on the day,” said Burke, who also enjoyed Giles Cup success with Trinity College around this time. Next up for Burke was one of his most difficult challenges, taking over his own club’s senior team and being in charge of a number of close friends. “That brought its own challenges. I was 27, 28 taking over my local club and all my best friends were on the team. I’d be very good friends with Hughie Lynch, James Gately, Frankie Barry was my best man when I got married two months ago, Paddy Griffin is my brother in law. Probably 20 out of the 26 man panel I would have been very close to. Even with some of the older lads, my dad would have coached the likes of Joe Kehoe and Frank Ryder all throughout their career. I have to say though they were fantastic. They probably weren’t happy with the previous couple of years, how they dedicated themselves and the overall setup. I came in and I like to be organised. We enjoyed ourselves as well when the time was right but I like to have things set up well and they really responded to it, I never had one minute’s problem,” said Burke. 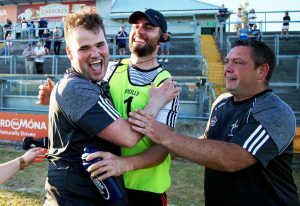 Confey pushed hard during Burke’s two years in charge, picked up a Division 1 league title for the first time in the club’s history and also reached the Senior Championship semi-finals for the first time. “We went seven months unbeaten, from 1 April to September when Sarsfields got the better of us by four points in the Championship semi-final, and we won the Division 1 league along the way. At the end of the two years, and this is the thing that I am most proud of, every single relationship was 100% still intact. I had two years with my own club, had relative success, and came out with an even better relationship with some of the lads so it was time to move on,” he said. He was at a loose end after that and was considering various options when Kildare legend Johnny Doyle got in touch with him to sound out his interested in taking the Kildare under 20 job. “I had nothing lined up when I left Confey, those were the only reasons I left them. I had three clubs get in touch, from Dublin, Kildare and Meath but I never met any of them. Johnny Doyle got in touch just to say that the Kildare U20s job was coming up, he was just sounding me out to see if I would go forward for it, he had no part of the interview or selection process. I met with Johnny, I knew the bunch of players already but Johnny just gave me a deeper knowledge of them. I liked what I heard so I said I’d go forward for it and that has led me to here,” said Burke. Managing at county level is another step up in terms of commitment and the recently married Burke is thankful that his new wife Shauna is very understanding about what the job entails. He is happy though that he put his foot down earlier in the year when the time came to book a honeymoon. “I’m actually going on honeymoon on the Wednesday after the final. Shauna works in a school and was booking this last February and wanted to go in July. She has been around a long time and knows the GAA scene and I was looking at the dates and said that we couldn’t go until after 5 August. This was back in February when we were still trialling players, had maybe 50 in, it was rainy, cold and mucky in Hawkfield and things might not have looked as promising as they do today. She might have had a few words for me then but I held firm and it’s worked out well. She is very, very understanding to be fair. We got married on a Saturday and I was back at training on the Tuesday. To be fair, she is part of it, she does a lot of things behind the scenes that people don’t see,” said Burke. His wife has to be understanding because Burke knows nothing else other than to throw himself into the job and completely devote himself to it. “Every week, the opposition analysis is massive. Either you get to the game or you get it watched. The Mayo v Derry semi-final was on at the same time as our semi-final so it was impossible to get to so we had another man there, a fella I’d trust from different things. We have the DVD and previous games DVDs, I’d even ring opposition managers. It’s one thing to see it on a DVD, it’s another thing to see the game live. There is nothing to it other than hard work and putting in the hours. You just watch hour after hour of tape and see trends, see key players. You try to see their kick out strategy, who is their key forward? How do they transition to defence? How do they transition to attack? “The key thing is I need to know everything about the opposition, the lads don’t need to know everything, they just need to know enough. I find that you can slip up if you give them too much information because at the end of the day this is a very good Kildare team. They have to focus on themselves. It’s up to the management to focus on the opposition,” said Burke. Speak to Burke for any length of time about his coaching career and it’s clear to see the influence that his father had on him. As fate would have it, Sunday’s final falls on the 15th anniversary of his death. Kieran Burke was hugely involved with both the Confey cluband the intercounty ladies scene and his name is honoured in Kildare GAA with the Kildare Ladies Senior Championship trophy named after him. His sudden passing after a heart attack when aged just 38 was a huge shock to the family and Sunday will have added significance for Davy, his mother June, his brother Jonathan, who is part of the backroom team, and his sisters Lisa and Niamh. “It’s a huge thing for us. It was three weeks ago that we got confirmation of the date for the final. I just posted it in the family’s Whatsapp group to say just keep us in your prayers. We still had the small matter of getting over Kerry at that stage so we weren’t too worried about the final then. My mother was a founder member of Confey and Confey ladies, my father was a very successful coach, he was very well regarded, I think I have a similar style to him. He was through some serious players and serious teams over the years. I went absolutely everywhere with him so that’s obviously where I picked up a few things. It would be mean a huge amount, an unbelievable amount to win. I did mention it to the players briefly after the semi-final in Limerick, just because I thought it might come up in an interview or something and didn’t want them hearing about it like that. I just talked about it for 30 seconds, that’s it and personally that’s the last I’ll mention it to them but I just wanted to thank them for getting us there and giving the family the opportunity to be in Croke Park and contest an All-Ireland final on a day that is important to us. That’s all it is. The day is an important day to my family whether we win or lose, it’s just an added motivation for me personally. It’s great the way it fell and hopefully he’ll be watching over us,” said Burke. His father would certainly approve of the steps that Davy Burke has made so far in his coaching career and he has plenty of time ahead of him to ensure that his name will maybe sit neatly alongside the likes of O’Dwyer and Ryan one day.